Not having a timeline – From the moment you choose the date of the big day, you are on a countdown of time. Try to make sure time is on your side by not making the big day too soon – the pressure of doing everything in limited time could ruin the occasion long before you get there. As any good wedding planner will tell you, create a timeline of everything that has to happen, working backwards from the big day to what has to be done right now. Not having a budget – This is another fatal error. You book a great wedding venue and then invite the whole World and their Aunty, only to find out you’re actually on a limited budget. Work out exactly what you can spend, then what fits into that budget and stick to it! Not knowing your service providers – It happens all the time, the caterer you booked told you he could produce dainty finger pastries for the arrival snacks and then produces messy mini-hamburgers because it’s all he really can do! Make sure you have good testimonials and personally interview all the service providers you book, to avoid tears on the carrot cake – which looks like a real carrot! Not paying attention to detail – We are not talking about just the little details of the flower arrangements and dinner settings – A good wedding venue can ensure these kinds of details are covered – We are talking about the important details of having your license documents in order and contracts with all your service providers. Many don’t even know, for example, that if you have been divorced you will have to present your ‘decree of divorce’ document to the priest or licensing officer preparing your wedding license. Also legal contracts can prevent service providers from mistakenly double booking and leaving you hanging for a more lucrative engagement! Not having a plan at all –The biggest blunder is not having any plan at all – This day is way too important to risk messing it up, so even if you are planning it on your own, partner with a great wedding venue like Valverde Eco Hotel. We have a detailed online wedding planner to ensure you don’t make any of these common blunders and we are happy to give you all the help and advice you will need to ensure this important day is as special as it should be. Many married couples to be have sleepless nights about who should be in the wedding party ….and sadly a few arguments too. Why let this question cause you to have bags under the eyes come the big day, when there are just a few questions you need to ask yourself to help you decide. So here are 7 good tips on who should really be in the wedding party. Gender doesn’t count – Remember that it’s not about whether you wanted the ‘Maid of honour’ to actually be the ‘Man of honour’ because the person you most entrust this honour to is ‘gay’ – or your Brother …or consider that your Father may be deceased, or through divorce is no longer part of your life, so you want Mum to walk you down the aisle. No problem. There are no hard and fast rules here. What matters is that the Bride chooses those closest to her and the Groom chooses those closest to him …even if the Best man is to be the Best woman! Make each other happy – Following on from that point, if your marriage is to succeed, you are going to spend the rest of your life trying to make each other happy, so this is a great place to start! Decide at the outset to choose the wedding party that will make you both happy. If she wants to invite that Cousin of hers that you can’t stand, to be a Bridesmaid and he wants the guy who used to call you ‘Big-nose’ at school to be Best man …just go with it. It’s a great way to show each other you will also try to care for the people they like. You can’t change your mind – Having said that, do openly discuss any reservations you have about certain people, for the simple reason that you can’t change your mind once the decision is made. So take time to discuss and think about the decisions you make. Who will really be a part of your future? – To help you decide on the last point ask yourself these questions: “Who has been the most important to us?” and “Who will really be most likely to be part of our future?” Don’t be surprised if that Sister, who is always there for you in any kind of situation, takes umbrage to you choosing a favourite school friend who’s emigrating next year as the Maid of honour. Brothers and Sisters just like Mums and Dads, unless you have had a huge fall-out with them, should always be part of the wedding party anyhow, as they are most likely to be a part of your journey together. Sometime size does count – Generally speaking, larger weddings do have larger wedding parties as there are more duties to perform and a huge wedding table at a small wedding is just plainly out of balance. Remember if the wedding is small, family members you would like to include can also be in other roles like M.C, ushers etc. You wedding is not ‘payback time!’ – Regardless of how many weddings you have attended (or not attended) your wedding is not supposed to be the event that pays everyone who invited you (Or didn’t invite you) back. If you are on a limited budget, ask those closest to you and that’s that. True friends will understand that some people just have to – or prefer to have small weddings! Choose reliable people – Remember that the wedding party are also the people who are assigned to carry out certain tasks– from arranging the build up parties to helping the Bridal couple choose everything from invites, to clothing, to a great wedding venue! Make sure that those you choose are people you can trust …and yes definitely include that Sister who is always a great shoulder to cry on. Things can get pretty emotional, so a close at hand support group are essential. So, it’s really not necessary to have those sleepless nights or arguments at all. It simply takes a little careful thought, the tolerance that only true love can inspire and these 7 good tips on who should really be in the wedding party. 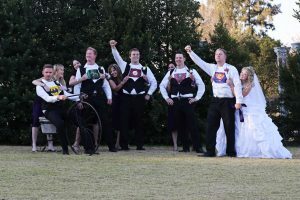 Here is a quick guide of the titles and roles of those usually included in your wedding party. A male attendant to the groom, the best man is valet, personal aide and advisor all rolled into one. Duties include getting the groom to the ceremony on time; signing the couple’s marriage register; and holding the bride’s wedding ring at the altar. He is also usually renowned for his toasting skills (humour works well here) and dancing savoir faire (he may be required to dance with your mother). A support team of friends and female family members who work well together, the bridesmaids are usually headed up by the maid of honour. Choose friends who you want by your side when completing pre-wedding tasks such as addressing invitations, making table favours, planning the hen’s party and more. Not just a walking wallet and the guy who gets to foot the bill, the father of the bride can also acquire a myriad of to-do’s along the way, such as airport transfers, and co-ordinating maps and directions to the site, along with his toasting and hosting tasks. Traditionally, the father of the groom pays for a handful of major items such as the rehearsal dinner or the bar bill on the day. He can also step in to carry out support tasks such as escorting the elder generation to their places, addressing problematic service at the venue, along with providing general moral support to the father of the bride. Usually proceeding the bride down the aisle while scattering flower petals from a basket (or carrying a pomander if they church doesn’t allow for petals), the flower child can be aged anywhere between three and eight. Once they have completed their role, they usually join their parents for the ceremony. They may also offer confetti to the guests to be thrown outside the church following the ceremony. A handful of male family and friends who assist the groom, the groomsmen are integral to the planning and preparing for the big day, especially in the organisation of the stag party (it’s the best man who foots the bill), decorating the honeymoon car, flirting with single ladies at the reception and offering services such as ushering and direction for confused guests. Ranging between 9 and 16 years of age, they fulfil the same tasks as their adult counterparts (except for involvement in any X-rated stag or hen parties). Their dresses are more demure versions of the bridesmaid dresses, while the young groomsmen get to wear a tux like the adults. The bride’s right-hand woman throughout the duration of the planning process and the big day, the maid or matron of honour (depending on whether they have been married or not) provides morale support to the bride. She also leads the bridesmaids, heads up the bridal shower and manages numerous details on the day, which include helping the bride to get dressed, toasting the bride and groom, signing the marriage register, adjusting the bride’s train at the altar, holding her bouquet during vows, and overseeing the collection of gifts at the reception. The nature of the bride’s mother’s role is entirely up to the bride. She may double as wedding planner, guest list moderator, traditional hostess, fashion advisor and general all-round champion for the success of the overall event. A possible doppelganger of the mother of the bride, the groom’s mom can step in to take on any of the bride’s mom’s responsibilities if she’s up to it. To prevent each from stepping on the other’s toes, the pre-nuptials should plan clearly defined to-do lists for each ahead of time. She is usually escorted down the aisle during the prelude. This is the cleric or official who performs the marriage ceremony. Examples include a priest, a rabbi, a minister, or a judicial officer. A child aged between 4 and 8 years, who walks down the aisle just before the flower girl carrying a small velvet pillow with two wedding bands tied to it (usually replicas are used in the event of the real rings getting lost). A Jewish term describing anyone close to the bride and groom who helps them plan and prepare for marriage. In many Jewish weddings, there is no traditional wedding party, but certain members of the shushavim (a mom, a sister, or best friend) might perform similar tasks. A Greek assimilation of the groomsman, in traditional Eastern Orthodox weddings, the vratimi – the groom’s male friends – help the koumbaro carry out his traditional role and perform various rituals. A Muslim term for male family or friends who help prepare the groom for and participate in the wedding. Among Moroccan Muslims, it’s common for the hattabin to propose to the bride on the groom’s behalf. 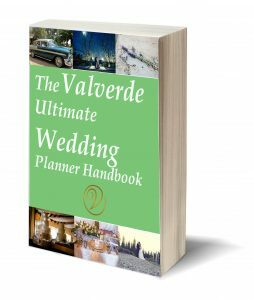 For a comprehensive guide on how to plan your wedding like a wedding pro click here to download our Ultimate Wedding Planner.